Twenty years ago, my kitchen garden was a hayfield, part of the ten acres we bought in the middle of Lopez Island, one of the San Juan Islands off the coast of Washington State. Today it is a collection of vegetable, berry and fruit tree beds divided into sections by wide swaths of grass and narrower gravel paths. A Leyland cypress hedge encloses the 120 by 110 foot garden on the south and west sides. More hedge, a greenhouse and a garden shed continue the enclosure on the north side, and on the east side, rows of fruit trees separate the garden from the lawn and house. Over the years, as the garden has become established, it’s done what I hoped it would: provided food in every season, grown more beautiful each year and become a place to welcome friends and family but also to cherish the solitary pleasures of gardening. The play of light and breezes in all seasons and weather, the texture and fragrance of healthy soil and plants, the year-round planting and nurturing of vegetables and fruit are all gifts of gardening in this temperate marine climate. Lopez Island is designated USDA Hardiness zone 7B. Frosts end around mid-April and resume around mid-October though each year is a little different. We’ve had some winters with no snow and temperatures that barely dip below freezing while in other winters we’ve had brief stretches of as much as two feet of snow and temperatures in the low teens. In summers, the one thing we can count on is very little rain. We are in the rain shadow of the Olympic Mountain range and yearly rainfall is twenty-six inches, most of it falling between November and May. In summers we can also hope for days when temperatures go above 70 degrees, but we don’t often get our wish. What these moisture and temperature ranges mean for kitchen gardeners on Lopez Island is that we need to irrigate in the summer but also have cloches or greenhouses for heat-loving crops, and in winter we need be prepared with extra mulch and protective tarps for occasional freezes streaming down from Canada. The community of kitchen gardeners here is generous in sharing growing tips for our climate, recommending seed varieties, and, of course, exchanging recipes. Lopez Island is also home to farmers who raise sheep, pigs, beef, goats, poultry and shellfish. We have the first-in-the-country mobile slaughter unit operated by the Islands Grown Farmers Cooperative (http://www.igfcmeats.com/1.html) making it possible for farmers to sell USDA inspected meat by the piece. 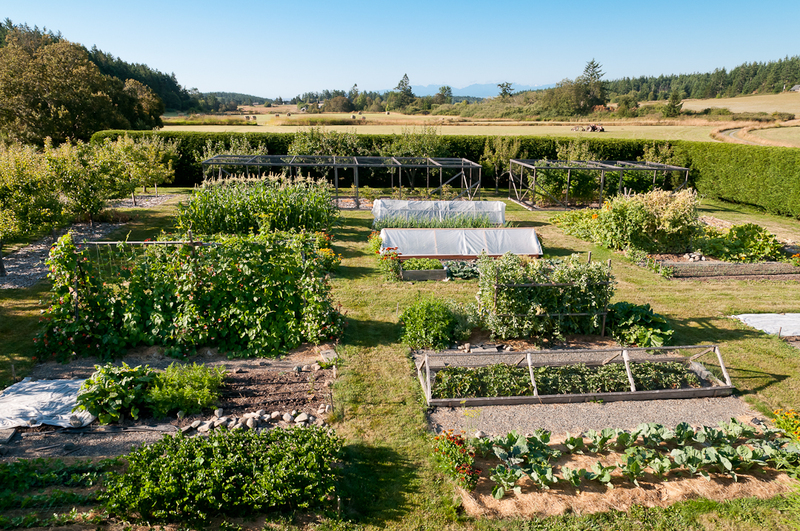 There are several specialty and market gardens, CSAs, apple and berry farms, even a winery and, on neighboring San Juan Island, a cidery and a goat cheese dairy. To read more about all of these resources that complement the bounty of our kitchen gardens go to my Green Living columns. 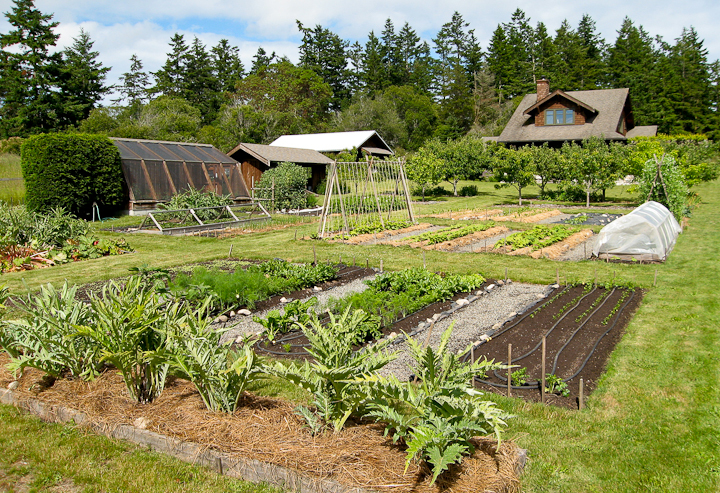 Over the five years that I wrote the Islands’ Weekly Green Living column about Lopez Island farms and farmers, I occasionally used my kitchen garden as a topic. 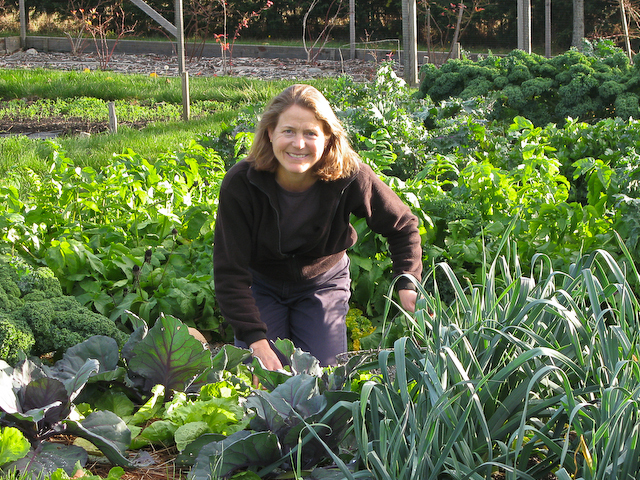 The pleasure of writing these personal columns has finally tempted me away from the monthly column and to this blog where I can write regularly about kitchen gardens, my own and the many others on Lopez Island. Join me as I explore blogging and the opportunities it offers for sharing ideas about kitchen gardens. And enjoy my husband Scott’s photographs of what we grow and eat. P.S. 7/31/13 Read my post reflecting on two years of writing this blog. Wonderful blog – can’t wait to read more and more and more! beautiful images, and well formed phrases….J’admire! Great site design and love reading your blogs. I’m convinced now that I must try growing some turnips! I am SO enjoying your beautiful garden blog from Lopez. Is that your personal garden in the header? I’m curious about the screened in beds on the left – I’m guessing berries? We have a place in the village and hope to be full time soon – I’d like to have a spot in the community garden. Thanks, Becki! Yes, the photo in the header is my garden and the screened houses protect blueberries and raspberries from the birds. I hope you’ll be growing vegetables in the community garden soon. Awesome garden, where on the island is it? Would love to drive by for inspiration. Having just acquired 20 acres a mile N of the village, we’re currently selecting an architect and builder for the house, but seeing your pictures, I can’t wait to start setting up our kitchen garden as soon as the soil dries a little. I checked the !box below for new posts…hope to get them…I have heard they are really fun!! Thanks, Nancy! I’m happy to know you’ll be reading new posts! Just got shown your website, very inspiring to me, thank you for putting this out there. Thanks, Jamie! I’m really glad that you like my blog. Hi, your brother Steve is here at our Porsche repair shop in Concord, CA. He’s so much fun …and has shown me this blog, as I’m a gardener also. We’ve been to Anacortes and liked the area very much. Wish we could move up there …you’ve got a beautiful place. Hello Debby, myself and my wife recently moved to Orcas Island from the east coast and we are currently doing a lot of work around the grounds of our home here, one area been the garden we have. Could you tell me what type of plant you used to produce such a wonderful hedge around your garden? We are looking at various options for similar screening etc and was curious to know what plants are best suited to the area and climate. Thank you kindly. The hedge plant is Leyland Cypress. Our site receives a lot of wind from the south and west and the hedge has been a great windbreak. We planted it in 1994, gallon pot size, 4 feet on center. The first few years we had to stake each tree but once they became established, the only maintenance has been yearly pruning of top and sides to keep it a manageable size. We planted the trees inside a fence because though deer don’t eat Leyland cypress, they will rub their heads/horns on the trunks and slowly destroy young trees. Hello from a neighbour just across the border on Vancouver Island–I’m intrigued by your pole bean arrangement on your Kitchen Garden Structures page. I’m looking for a way to get my pole bean structures up every year in a fast method. Your post says you put them up every year. My question is, ‘how much assembly is required?’ Do you take it completely apart? Are the tall triangles permanently together or not? I have lots of 2×2 douglas fir, and don’t want to back screws in and out of it too often. Thanks. Hi Debby I was wondering if you could share the layout of your garden? I am in the process of planning our first and I love the way yours is arranged! I have a few questions about Lopez Island and would love, if you have a moment, a moment of your time! Thank you. I am happy to have found your blog. I love your garden! Beautiful layout and interesting variety. Hi, Debby. I was hunting the web for any information I could find about pear and apple trees on Lopez Island. My husband and I just purchased 5 acres just east of the Village on Fisherman Bay Road. They property comes with 4 old pear and 4 old apple trees. We live in Texas and hope, some day, to make Lopez Island our forever home. In the meantime, I need some info on the pear and apple trees. By looking at your photos, I think the Pears may be Orcas pears. The end of Oct. the fruit was falling off in the pasture and the deer were collecting under the trees. Same for the apples. We ate a few of the apples; they are firm and on the tart side. I have photos of the apples and pears I would love to send you to see if you could identify the variety. The trees are sooooo neglected! I am an avid gardener here in central Texas but we don’t grow apples and pears here. The farm house (circa 1900) used to sit near the road, and I’m pretty sure the fruit trees once surrounded the house. The house now site towards the back of the property. Your email address kgwiburn48@yahoo.com bounces back as undeliverable. Is there another address? Well, this is handy. I keep trying to remember, “How did Deb cook all this Kale and stuff so it tastes really good?” Here is the answer sheet and there are pictures. This makes me very happy. Thanks Deb. Thanks, Mike! Glad to know you liked all that kale and stuff at our house! Hello from Denmark, Svendborg in the south of the island of Fyn. It was your greenhouse which lead us to you. A very nice garden you have, it looks like your climate is much similar to ours. Springtime is near and i sown tomatoes yesterday, Brandywine is my favourite, we love it fresh in the sommertime and out of the freezer in the wintertime to make the finest tomato sauce. A nice spring to you. Hello– I’m so pleased to find your blog! I work with the Whatcom Farm-to-School team, and we are looking for local winter squash photos to use in a few education slides we share with public elementary schools. If I point teachers and students to your blog, may I use a few of your photos? I really wanted to know how far apart were your Leyland Cypress plants planted to get that beautiful, dense hedge you guys have! Hi. So I was looking for ideas for a bean trellis for my tiny (compared to yours) garden and stumbled across your blog. And I noticed that you were on Lopez Island – not a massive town, so I must ask. Do you know my aunt? She goes by Brooks Brooks, Carolyn Brooks, or Carolyn Brock (her birth name). We just bought a property on the South end of the island and drive by your place to get there. There is an old orchard with as many as 15 prune trees that have not been tended for a long time. We want to revive the orchard and would appreciate to know who to contact on the island to get help. Your garden is just beautiful! Thanks for writing. I’m pleased that the spring turnip and red quinoa preparation has made its way to your CSA. Where do you live? While I’m not part of the Road Scholar tour, I think you’ll be very near my kitchen garden if the tour this year takes you to Sunnyfield Goat Farm. Enjoy the San Juans! September is a great time to be here. My book – Geobop’s State Symbols – is an ebook and will probably be finished sometime in July or August. I’ll have more information about it online at http://www.kpowbooks.com soon. So lovely to find your blog and to see your picture. You look fantastic, and so does your garden. It’s a six degrees of separation story about some new neighbors of yours who will be arriving this summer–he is the brother of my best friend from the Seattle days and found your blog when doing research about his gardening future on Lopez. I’m in Montana now (for 14 years) and loving it, although MT does not offer such lush gardening. Looking forward to hearing from you. I came upon your site when doing some checking on the GILFEATHER TURNIP. You mention FEDCO Seed Co. and John Gilfeather. I AM the Mary Lou Schmidt mentioned.. FEDCO was one our first wholesale buyers. We are doing the history of how we registered the of Gilfeather with USDA.. As you may know, the Gilfeather Turnip became Vermont’s State vegetable in 2016. I have the Governor’s pen that signed the document. Thanks for the feedback. I’ve been working on this book for over a year now and am finally within about a month of finishing it (I think). I actually began researching it three decades ago. At any rate, I’m amazed at all the stories I’ve uncovered. There’s far more to state symbols than what we read in the mainstream references. I have been enjoying your blog now for the last few months. I was wondering if you could recommend a variety of apricot and peach that grows well on Lopez ? I don’t have any recommendations for apricot or peach varieties for Lopez. However, Jim Birkemeier here on Lopez is a great authority. I saw him the other day and he said he’d recently planted more peach trees. I’d suggest giving him a call: 3775. I’m glad you enjoy my blog. Thanks!